In a secretly recorded Watchtower talk, a Jehovah’s Witness elder is heard making multiple statements that may just leave members shaking their heads. The contents of this talk are extremely telling, and even frightening. The organization is aware that many members cannot leave because they’ll lose their families through the practice of shunning. Consequently, they’re causing doubt amongst members, furthering the lack of trust amongst friends in the Kingdom Halls, and strengthening the reliance and dependence on the Governing Body superiors. Indeed, it is a fact that many ExJWs attempt to reach out to current JWs, to help lead them toward the bible itself, and Christ Himself, through faith alone. 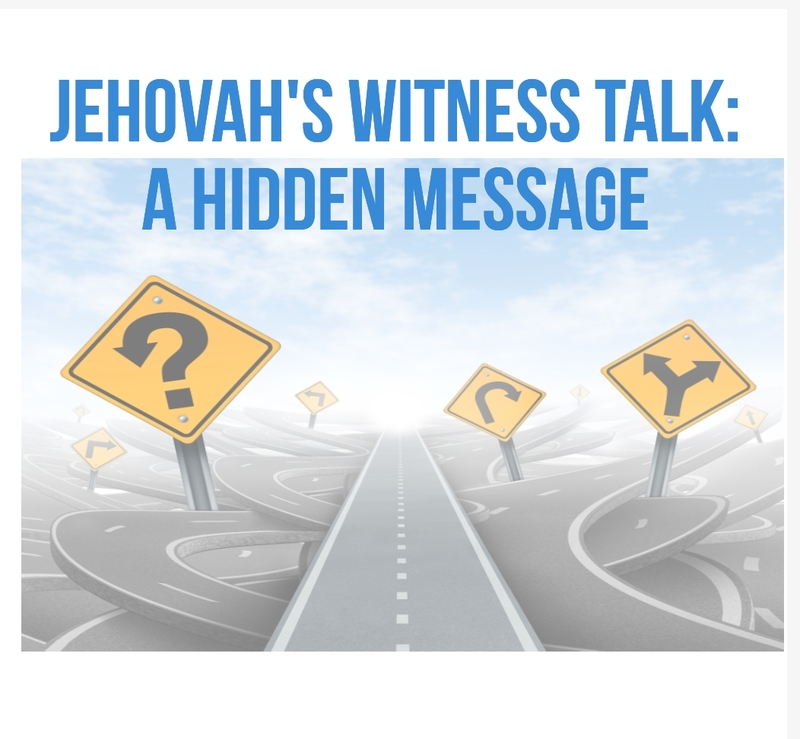 Many want to offer support, but moreso show clear bible texts that will awaken the JW to the truth, and release them from the grip of the dependence on Watchtower teachings. The speaker points out that even current members wish to lead people “away” from JWs by leading them to Christ. Many ExJWs wish to introduce current JWs to the truth about Christ, and Watchtower is referring to those who leave as “Christ’s disciples”. I hesitate to point out this may be the ultimate Freudian slip. In this talk, the speaker also goes on to state the apostates might criticize the revised edition of the New World Translation JW bible. To expand, he goes on to show John 3:16 was in fact changed by the Watchtower. He gives his explanation as to why it was changed, as the new wording now matches their own doctrine of works-based salvation. He says, “With good reason the New World Translation committee worded it that way.” The congregation is supposed to take his word for it, and many likely will, nodding like robots. You read it correctly. Watchtower is blatantly taking the stance that scripture may not be in line with JW teachings or the Governing Body. They continue to teach that Holy Spirit only operates through a “channel” and that biblical understanding can only come through the Governing Body. They believe they have secret knowledge only known by them, through a “channel” that provides them with information that they “dispense”. The bible suggests truth & understanding can only come through the Holy Spirit, and Jesus Christ. See 1 Cor 12:3,7; Ephesians 1:7-18. Therefore, Watchtower Governing Body is self appointing themselves as Holy Spirit. If they were simply praying for wisdom, they would not call themselves, “God’s channel of communication”. How does each Governing Body member prepare to channel with God? Do you believe in channeling? If no, why are you the only religion who uses the phraseology, “channel of communication”? Communication between who? If I believe I can get special knowledge from God through “channeling” with Him, don’t you teach that such a practice is demonic? How do your leaders perform the act of channeling? Have you ever met all 7 members of JW Governing Body who believe they can get secret information from God? Do the GB members engage in trance like states to communicate with God? How do you know the answer to this question? Have the 7 men who propose to get special knowledge and messages from God provided proof of documented psychiatric evaluation? How do you know they do not have psychiatric disorders? Have you ever studied the minds of cult leaders?